A Catholic Womens group in West Papua has called for regional support for their people's plight, after a visit to the Indonesian territory by Catholic Bishops from other parts of Melanesia. 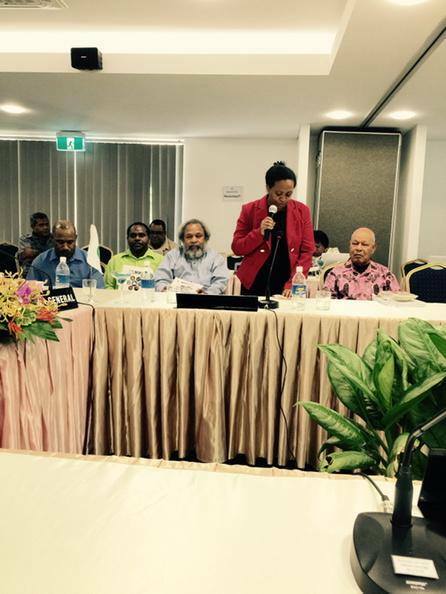 23 Bishops from Papua New Guinea, Solomon Islands and Fiji visited West Papua last week. Among them were the Archbishop of Port Moresby, John Ribat, and the Archbishop of Honiara, Adrian Smith. As they travelled to Jayapura from PNG for what has been described by the Catholic Womens group as a type of fact-finding mission, the bishops were closely accompanied by Indonesian military. Although restricted in who they could talk with, the bishops had a meeting with the Bishop of Jayapura and met with some students. Papua, 44 West Papuans were arrested by Indonesian police during demonstrations across Papua region yesterday. 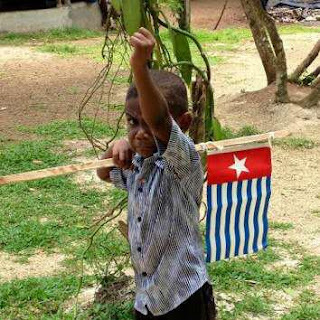 The demonstrations in the main cities of Papua and West Papua provinces were voicing support for the United Liberation Movement for West Papua and its bid for full membership in the Melanesian Spearhead Group. Thousands of West Papuans marched in the peaceful demonstrations in cities including Jayapura, Yakuhimo, Manokwari, Merauke and Sorong. "We have rejected the central government's transmigration of this discourse. If you want transmigration, yes local transmigration alone. Instead of Java or other areas outside of Papua.Poor people move to Papua is the same as bringing the problem to the Land of Papua. Not only economic issues, employment and social issues, but I am concerned, transmigration will make Papua native could be lost from the land of Papua is within 10 to 20 years into the future, depopulation Papua native, "said Governor of Papua, Lukas Enembe to Jubi, at the residence of the governor, in Jayapura, Saturday (10/17/2015) night. UK) – New video footage showing the bloody aftermath of the ‘Paniai massacre’ in West Papua highlights the urgent need for Indonesia to hold an independent and transparent investigation into the tragedy, Minority Rights Group International (MRG) said on Thursday. injured when the Indonesian army and police opened fire on a group of peaceful protestors in Paniai. They had gathered to protest an earlier incident of violence by the Indonesian security forces. The four-minute video, shot by citizen journalists and released publicly for the first time today, includes first-hand testimony from survivors of the massacre as well as graphic footage taken in the immediate aftermath. The massacre is one of the worst acts of state violence in Indonesia in years, casting doubt on President Joko Widodo’s commitment to human rights in the region. More than six months after President Widodo was sworn into office pledging to ‘give special attention to West Papua,’ there has been little change on the ground. perpetrated by Indonesian security forces. The resource-rich region has been systematically exploited by Indonesian and international business interests at the cost of climate change and the indigenous population. Thousands of indigenous people have been evicted from their lands as a result of large-scale development projects implemented without obtaining their free, prior and informed consent. Dalam KTT MSG di Honiara, Solomon Island pada hari Senin 22 Juni 2015. Eksekutif ULMWP sedang mempersentasikan penembakan kilat, penangkapan, penyiksaan dan pemmenjarahan yang di lakukan oleh TNI dan POLRI, saat KNPB mediasi rakyat West Papua mendukungan ULMWP untuk menjadi anggota Penuh di MSG dalam beberapa bulan terakhir di seluruh Wilayah West Papua. Presentasi ini di sampaikan oleh seorang perempuan Papua Barat (Leoni Tanggahma), mewakili Mama-mama Melanesia di West Papua yang penuh dengan haru dan air mata membuat para menteri - menteri negara - negara anggota MSG. 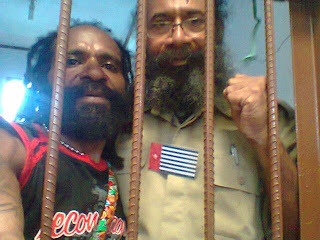 Anggota hadir dalam KTT MSG sangat tergugah jiwa mereka sebagai orang Melanesia dan kesal dengan tindakan Militer Indonesia di West Papua. 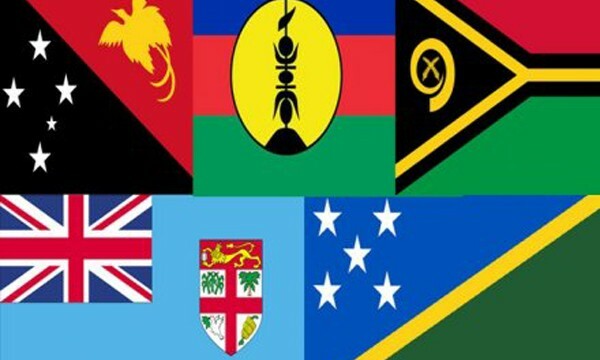 Jayapura,-- 98 international non-governmental organizations, academics, politicians and people from the Pacific appealed to the leaders of the Melanesian Spearhead Group (MSG), in order to give full support to the application of West Papua that have been proposed to become a member of MSG. 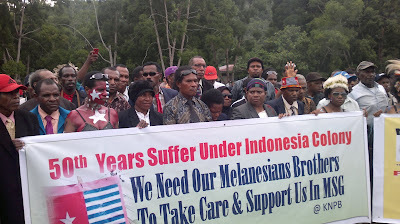 Through a press release sent to the editor Jubi, Tuesday (15/10), a group of organizations from Fiji, New Zealand, Australia, Thailand, Philippines, India and the United States have highlighted the threat to the survival of indigenous peoples in West Papua Melanesia, whose population is declining drastic. Also the human rights violations that are taking place in West Papua, including the denial of the right to self-determination.